Kombucha: Healing Elixir Or Expensive Iced Tea? Perhaps you’ve heard of it: a vinegar-tasting drink made with a symbiotic colony of bacteria and yeast (SCOBY). If you haven’t tried it yet—you’re missing out on a trend that is sweeping our nation. Made with tea, sugar, and a Frisbee-shaped disc of slimy goodness (the SCOBY) —kombucha is a trending drink among foodies alike. This fermented tea drink claims to have many health benefits—from digestive regulation to fighting cancer— and many people swear by this mysterious concoction. 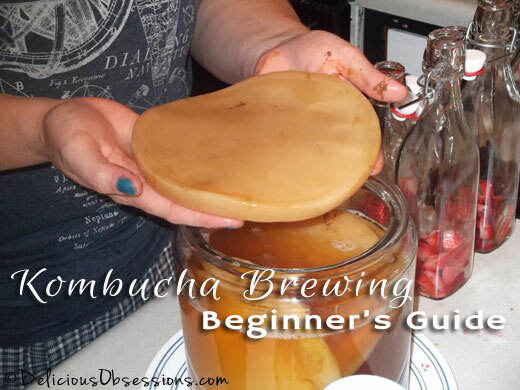 Once kombucha is made, a myriad of flavors can be added to the fermented tea. Flavors currently on the market include watermelon jalapeno, hibiscus, ginger grapefruit, and lavender. Needless to say, kombucha is a refined taste. Some describe kombucha as vinegary and dry—whereas others use adjectives resembling refreshing and tart. Kombucha made big news in 2010 when studies showed certain brands contained between 2 and 3 percent of alcohol. Read about it here. Despite its growing popularity, scientists have yet to publish findings about kombucha’s powers in a major medical journal. The Center for Disease Control is among kombucha’s skeptics. “Although advocates of Kombucha tea have attributed many therapeutic effects to the drink… its beneficial and/or adverse effects have not been determined scientifically,” the CDC said in a 1995 article. “This doesn’t mean that kombucha tea can’t possibly have health benefits, it just means that at this time, there’s no direct evidence that it provides the benefits it’s reported to have,” says Mayo Clinic internist Dr. Brent A. Bauer.